East Lothian rugby clubs have enjoyed halcyon campaigns with Ross High (East Division Three) and Preston Lodge (National League Three) already promoted. Saturday sees Musselburgh attempting to join them when victory at home to second place Howe of Fife could earn these current pace-setters a place in National League Division One next season. 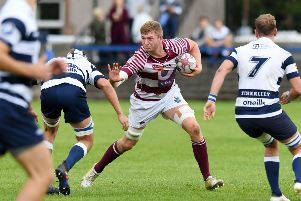 Not to be overlooked are North Berwick who, by winning at Hawick Linden, could take advantage of any slip by Dalkeith when they entertain Hawick Harlequins and go up from East Division One. Promotion for Preston Lodge comes in the wake of an unbeaten season in 2013-14 but coach Mark Steedman admits they have had to do it the hard way this time. “One of the incentives in our final match at home to Perthshire on Saturday is to avoid a third straight league defeat. It’s been an extremely open league as shown by the fact we go up with five defeats. “What this also reflects, though, is the variation in form by some opponents when playing away from home. This time round, and particularly when injuries hit hard after Christmas, we had to show a lot of character and dig our results. “A lot of credit must go to captain Chris Dixon and the boys for the way they responded to the pressure. “Chris has been with the club from mini-rugby days and has really emerged as a leader. “Another key element has been the arrival of stand-off Hamish Munro from Boroughmuir. “Hamish has done a really good job as has prop Nick Hart, from Stewart’s/Melville. “I’d love to say the aim is another straight promotion but realistically it may be time to consolidate before pushing on again. Steedman is delighted to see local rivals also excelling while recognising that last Friday’s clash against neighbours was a bit of a reality check. Musselburgh coach Grant Talac was equally delighted his side maintained a try-scoring touch that has seen them claim bonus points in each of their last seven league outings. Key to Musselburgh’s success has been the return of a string of players to their roots after spells sampling Premiership action. Craig Owenson and Declan Slaven have returned from Heriot’s while Danny Owenson was at Gala and Andy Lamb played for Edinburgh Accies. “They are all Musselburgh lads with a pride in the town and our club and their experience has helped enormously. A thumping Scottish Cup win at home to Peebles who sit comfortably in the division above helped imbue Muselburgh with confidence and now comes a severe test against a Howe of Fife side who ran Heriot’s close (30-33) in the BT Cup quarterfinal at Goldenacre. “That result shows the quality of the league we are playing in,” said Talac. “Now we are hoping as many supporters as possible turn up and Saturday to help push us over the promotion line” noted Talac a former Edinburgh prop forward who, earlier this season at Cartha QP, came off the bench for a 12 minute cameo performance and claimed a try.